The problem for Microsoft isn't that the PC ceased being the primary computing device. It's that you can't charge for software anymore. On the surface, this statement by Asymco analyst Horace Dediu is clearly and obviously false. For 2013, Microsoft’s Windows and Business (read: Office) divisions alone generated, collectively, $44B in revenue. This number was up around 4% from the year before, after being up 3% in 2012 versus the year prior. This comment, in other words, is easily dismissed as hyperbole. But given that the overwhelming amount of evidence contradicting the above statement, and his familiarity with capital markets, it’s highly unlikely that Dediu would be unaware of this. Which makes it reasonable, therefore, to conclude that he did not intend for the statement to interpreted literally. Which in turn implies that Dediu’s making a directional statement rather than a literal description of the market reality. Even if one gives, for the sake of argument, Dediu the benefit of the doubt and assumes subtlety, the next logical counterargument is that he’s unduly influenced by his focus on consumer markets. The trend there, after all, is clear: the majority of available consumer software is subsidized by either advertising (e.g. Facebook, Google, Twitter) or hardware (e.g. Apple). More to the point, both of these models are attempting to exert pressure on the paid software model, as in the case of the Apple iWork and Google Docs competing for mindshare with the non-free Microsoft Office or the now free OS X (non-server) positioned against the non-free Microsoft Windows. Even in hot application spaces like mobile, it’s getting increasingly difficult to commercialize the output. If this is your analytical context, then – and certainly Dediu’s primary focus (Asymcar notwithstanding) is on Apple and markets adjacent to Apple – the logical conclusion is indeed that software prices are heading towards zero in most categories, and that software producers need to adjust their revenue models accordingly. No surprise then that it is by labeling the decline of realizable revenues as a consumer software-only phenomenon that enterprise providers are able to reassure both themselves and the market that they are uniquely immune, insulated from an erosion in the valuation of software as an asset by factors ranging from the price insensitivity and inertia of enterprise buyers to technical and/or practical lock-in. And to be fair, enterprise software markets are eminently more margin-oriented than consumer alternatives, not least because businesses are used to regarding technology as a cost of doing business. For consumers, it has historically been more of a luxury. But the fact is that the assertion that it’s getting more difficult to charge for software is correct, as we have been arguing since 2010/2011. The surface evidence, once again, contradicts this claim. 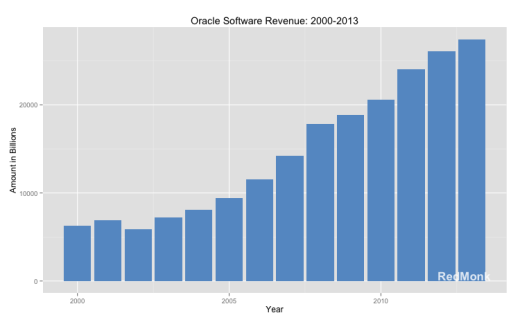 Consider the chart of Oracle’s software revenue below. This, for Oracle, is the good news. With few exceptions, notably a market correction following the internet bubble, Oracle has sustainably grown its software revenue every year since 2000. The Redwood Shores software giant, in fact, claimed in October that it was now the second largest software company in the world by revenue behind Microsoft, passing IBM. If a company that large can continue to generate growth, year after year, it’s easy to vociferously argue that the threat of broader declines in the viability of commercial software-only models is overblown. 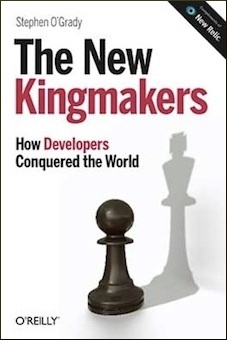 But this behavior, common to software vendors today, increasingly has a whistling-past-the-graveyard ring to it. Whatever your broader thoughts on the mechanics of Dediu-mentor and Harvard Business School professor Clayton Christensen’s theory of disruption, history adequately demonstrates that even highly profitable, revenue generating companies are vulnerable. Oracle, for example, is as a software-sales business challenged by a variety of actors from open source projects to IaaS or SaaS service-based alternatives. To its credit, the company has hedges against both in BerkeleyDB/MySQL/etc and its various cloud businesses. It’s not clear, however, that even collectively they could offset any substantial impact to its core software sales business – while not broken out, MySQL presumably generates far less revenue than the flagship Oracle database. Software was 67% of Oracle’s revenue in 2011, a year after they acquired Sun Microsystems and its hardware businesses. In 2013, software comprised 74% of Oracle’s revenue. The question for Oracle and other companies that derive the majority of their income from software, rather than with software, is whether there are signs underneath the surface revenue growth that might reveal challenges to the sustainability of those businesses moving forward. Consider Oracle’s 10-K filings, for example. 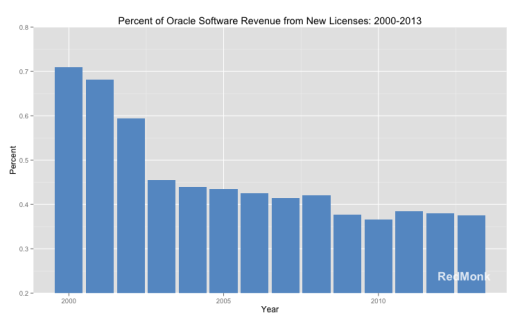 Unusually, as discussed previously, Oracle breaks out the percentage of its software that derives from new licenses. This makes it easier to document Oracle’s progress at attracting new customers, and thereby the sustainability of its growth. 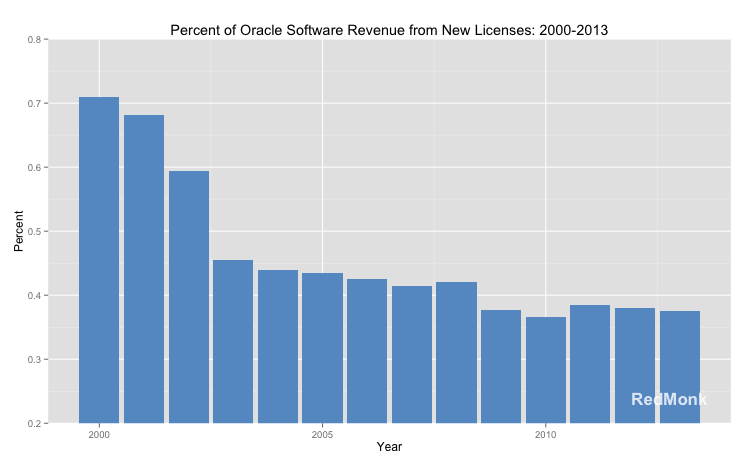 The chart below depicts the percentage of software revenue Oracle generated from new licenses from 2000-2013. There are a few caveats to be aware of. First, there are contradictions in the 2002 and 2003 10-K’s; second, where the 2012 10-K reported “New software licenses,” the 2013 10-K is now terming this “New software licenses and cloud software subscriptions.” With those in mind, the trendline here remains clear: Oracle’s ability to generate new licenses is in decline, and has been for over a decade. At 38% in 2013, the percentage of revenue Oracle derives from new licensees is a little less than half of what it was in 2000 (71%). Some might attribute this to the difficulty for large incumbents to organically generate new business, but in the year 2000 Oracle was already 23 years old. Consumer software, enterprise software: it doesn’t much matter. It’s all worth less than it was. If you’re not adapting your models to that new reality, you should be. Disclosure: Oracle is not a RedMonk client. Microsoft has been a RedMonk client but is not currently. Nice article.Due to the increase in competition it becomes difficult to patent a new software. What about the shareware market? Is it declining ?